Welcome to another Kylie’s Demonstrator Training Blog HHop where we have International Demonstrators inspiring you with projects. Today I have a very easy card for you. However, I think it looks like a WOW card. Simple Stamping Lovely Lattice shares with you just one stamp and one ink. 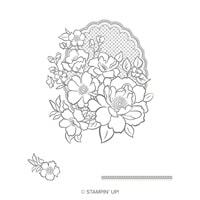 Tip: Choose a stamp, Lovely Lattice Cling Stamp Set, and a colour or tone, Basic Black A4 Card Stock and Whisper White A4 Card Stock and just stamp. 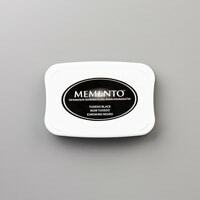 Choose one of the colours or tones to stamp with, Tuxedo Black Memento Ink Pad. I really should try to sleep when I’m supposed to but I came up with this idea in bed the other night and thought I should share it with you. Don’t forget to join me for a few laughs and some stamping, today at 12 noon, Sydney Australia time on my Facebook Business Page. Click the link or the banner above to take you there. 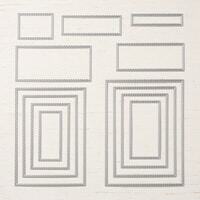 Use the Rectangle Stitched Framelits Dies to add a bit of interest to your card. Tip: Stamp a simple sentiment to finish off your card in the same tone or colour. 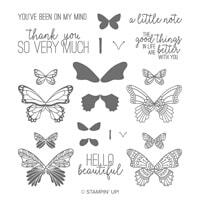 My sentiment comes from the Butterfly Gala Photopolymer Stamp Set. Simple elegance, Libby. Love it. Great card. Love black and white! Lovely Card! love the simplicity of black and white! And how you stamped the flower on the inside and on the envelope!